Thanks to the milder weather and rain this week, most of the snow has melted in our backyard. Some of the tulips and daffodils are coming up, actually. Spring is finally here! That had caused some momentary panic – we still haven’t planted our seeds yet. It’s been three weeks since we bought our seeds from Seedy Saturday, and they’re still sitting in the den. We don’t even have the dirt to plant them in. All we’ve got are seeds and some plastic milk bags (I read somewhere that milk bags are good for starting tomato seedlings because you can roll them up to add more dirt as the seedling grows.) We plan to go to a local garden centre to get supplies and get those seed planted this weekend. Only six more weeks until the “official” gardening weekend in southern Ontario – Victoria Day long weekend. Reminder – Seedy Saturday Tomorrow! 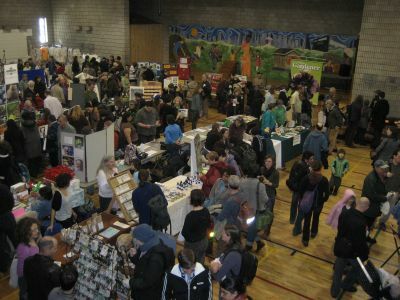 If you’re in Toronto tomorrow, don’t forget to check out Seedy Saturday! I am very excited to shop for some seeds for my garden. Saturday, March 15, 2008, 10 a.m. to 3 p.m.
There’ll be vendors selling seeds and organic gardening products, free seminars and workshops. When we bought our house, one of the things we fell in love with was the yard. There’s a lovely perennial garden and lots of mature trees. In fact, one of our favourite things to do in the summer is relaxing in the shade. However, we also blame this shade for the poor yield in our vegetable garden. We have these overgrown elm hedges that are over fifteen feet tall, our garden gets full sun for about five hours at the height of summer. In the past two years, we’ve produced one medium size fuzzy melon, a handful of tomatoes (they almost never make it to the kitchen), three peas, some radishes that are the size of marbles, and stumpy carrots. Quite sad, really. We hope to have better yield this year so we’ve decided to cut those hedges down to a more reasonable height. I really hope to grow some vegetables to supplement our local food diet. Any suggestions for vegetables that are easy to grow from seeds? I’m very excited to announce that I’ve just joined The Growing Challenge started by Melinda over at ElementsInTime.com. What a great idea! I had planned on growing some new vegetables from seeds anyway and now I’ve found a group of people doing the same thing and sharing their experiences. Most of the participants are from the US, and they’ve got sprouts already. I’m jealous – my yard is still covered in a foot of snow, and I think we’re getting some more tomorrow. For this challenge, you must grow one additional type of fruit or vegetable than you did last year, and grow it from seed. If rule #1 is not enough of a challenge for you, you may make your own rules. You must post about gardening once each week. This could be a post about researching different plants, ordering seeds, buying pots, digging beds, planting the seeds, pruning, adding compost, all the way to preparing a meal that includes the food you grew. With Spring being just over a month away, I’ve been thinking about what to plant in my garden this year. In the past, I usually plant some tomatoes, bell pepper, peas and herbs. Since researching into local foods, I’ve found a couple of places that sell heirloom vegetable seeds. So this year, I’m going to be more adventurous in my gardening. I plan on heading down to Seedy Saturday (a grassroots seed exchange and gardening fair) and buy myself some unusual seeds and grow them in a mini-greenhouse. On a side note – I found out about Seedy Saturday from an ad in a new magazine called edible Toronto – a magazine dedicated to local foods in the Toronto area. Interesting articles and lots of good resources. I picked mine up at the Dufferin Grove Market a few weeks ago. You can also view the articles online. Urban Harvest – They sell seeds, seedlings and garden supplies. They have an online store and a nursery that operates during the growing season only. Clover Roads Organic Farm – has an online seed store, mostly heirloom tomato varieties. 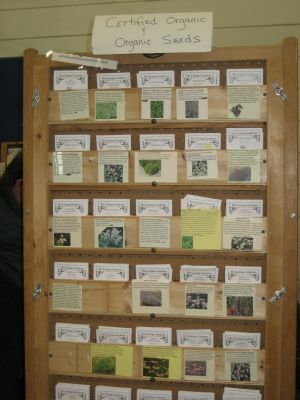 Everdale Organic Farm – They sell seeds at their farm store.